The worst part of PostmodernVillage's 2010 conference was finding the damn thing. 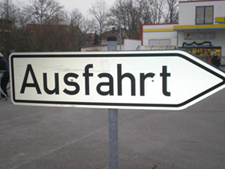 The sitting committee having split between Germany and France, the only affordable compromise seemed to be the cross-border town of Ausfahrt/Sortie, famous as much for its ubiquity as for its sausage and wine. But once we got on the ground, every sign seemed to be pointing there, no matter on which side of the border one landed or the distance one traveled to or from the border itself. These perplexities may have contributed to the economic downturn doldrums to conspire toward a low turnout, but once the stalwart and geographically imaginative made their way there, enough productive conferencing happened to make the trip worthwhile. After all, we're all now beholden to the neocons who have fled government and industry for academe, and they proceed to make things difficult for the rest of us with either the vacuous optimism of the charitable or the reforming zeal of the converted. The Market Model dictates that conference-attendance pass the cost-benefit analysis test, never mind how well these analyses worked when it came to the relative risk of collatoralized debt obligations. But that was not really PMV's problem. Following the lead of our financial betters, we left the fallout to those reporting back home, though we did feel a pang of regret for having asked a conferee from Stanford how things were going now that their past provost is back on the loose. It was sad to see a man so close to retirement so openly weep. 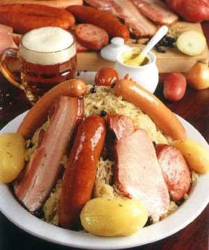 The hospitality of the Sortie/Ausfahrters, at any rate, was served up in typical Alsatian style—with plenty of sauerkraut and trotter of dead hog, washed down with a variety of nectaresque white wines. Bad behavior was at a minimum this year; as the World Cup-cranked locals seemed so much more like pros, few of us academics bothered embarrassing ourselves by tempting comparison. Still, rioting over the footie is a decent substitute to constant war, castellated reminders of which continue to crumble over every town in the Vosges and in every tower-turned patisserie. In fact, we had only one run-in with the local gendarmerie, and that was when Stan Wankey accidentally locked his passport-and-wallet-containing jacket* in his rented townhouse and the extra key had to be fished out through the mail slot. Thank goodness for the abundance of grape vines of odd configurations and cops with a patience for American professorial absentmindedness! But then, a patience for American imperial absentmindedness could easily describe most of Europe's reaction to our foreign policy. Given that these sorts of digressions get one stopped at DFW by the TSA and questioned about the imaginary presence of over $10,000 in cash in one's supposed baggage, perhaps it would be prudent to start with the papers already. * You know, the nice one? From Travelsmith?